Take a Limo or Party Bus to the Casino! When you want to spend a night out with friends, there’s nothing more exciting than going to a casino. Casinos offer plenty of entertainment, dining and opportunities to bring home a little cash, too. What they don’t offer is transportation to and from their locations, which is where Premiere #1 Limousine can play a huge part in your next trip to the casino. Premiere #1 Limousine offers chauffeur transportation to your favorite regional casino, offering you the perfect, relaxing and high-class way to get safely to and from the casino. Feel like a high roller with our casino limousine service in PA. Contact Premiere #1 Limousine today and schedule your limo service to the casino for you and your buddies. It’s the perfect way to have an awesome time. Let’s face it — what could be cooler than having a casino limousine service come right to your door? Everyone in the neighborhood will wish they were traveling with you! Beyond the excitement of getting chauffeured to the casino, there’s also the affordability factor. Why spend money on gas mileage and take tons of vehicles? Get a casino party bus rental from Premiere #1 Limousine instead. Save your cash for the casino! When you’re at the casino, you want the freedom to let loose and maybe even have a few adult beverages of choice. The good news is you won’t have to drive back home afterward. Our background-checked, trained chauffeurs will do all the transportation so you can sit back and relax. With one of our party buses, you can extend the excitement beyond just the time you’re going to be at the casino. The party will start as soon as you step foot onto our party bus. Sometimes you just want to do something a little different. If you and your friends regularly take trips to the casino by driving yourself, why not shake up your style? Get dressed up and rent a party bus. It’s a fun way to make any casino night shine. Unless you clean your car every day, it’s probably never going to be as pristine as our limousines and party buses! At Premiere #1 Limousine, we make sure our limos are immaculate. That way, you don’t have to worry about getting your clothes dirty or riding to the casino in a less-than-spotless vehicle. How many times have you forgotten where you parked? Who wants that kind of hassle, especially when you’re going to the casino to leave the world behind? Our limo drivers will pick you up right at the entrance to the casino when you’re ready to go home. Spend more time in the casino and less time walking to your car in the dark. Our limousine chauffeurs always know the way to the casino, so there will be no wrong turns to worry about. Why should you have to concern yourself with matters like maps and GPS when you should be spending time with your buddies? You don’t have to plan weeks and weeks ahead to have limo service to the casino. Just call Premiere #1 Limousine when you know you want to head out during the weekend, and we’ll get you on the schedule. Usually, we can accommodate your needs as long as we know a couple of days in advance of your event. Want to make plans to go to the casino during the week? Our Premiere #1 Limousine services are available seven days a week. 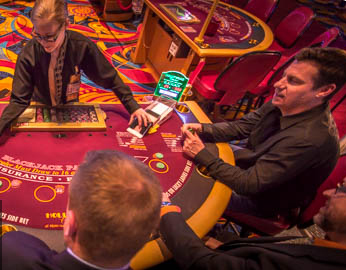 Whenever your trip fits into your schedule, we will be there to offer limo or party bus rentals for casino nights that are ideal for your needs. Ready to have the night of your life? Grab a group of friends, coworkers or family members and contact Premiere #1 Limousine service in PA for luxury transportation to and from the casino. Get those phones ready to take some social media-worthy snaps!